This is the fork in the road that divides those who really want to see basketball at its best, and those sometimes-NBA fans that just can't get over some guy actin' like a real jerk. 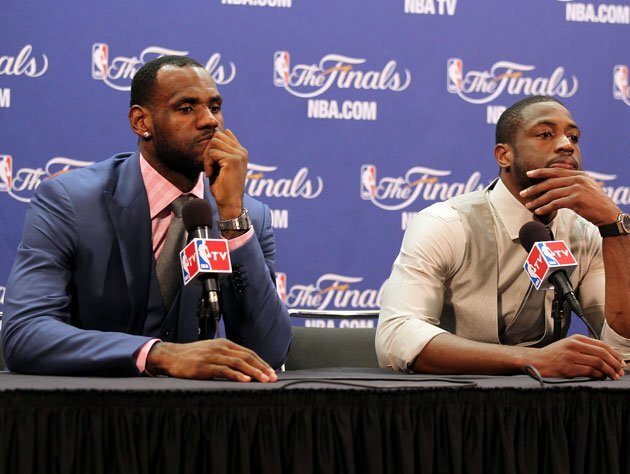 LeBron James is set to be judged, again, as his Heat hit the Finals stage on Tuesday, and a good chunk of the talk surrounding the series will focus on whether or not James can make up for either the awful way he announced his decision to jump to the Heat in July of 2010, or his relatively awful play in June of 2011 during last season's Finals. "I didn't play well," he says now. "I didn't make enough game-changing plays that I know I'm capable of making, and I felt like I let my teammates down." This is where those of us who attempt to take some high moral ground as we pretend that The Decision doesn't play a role in our judgment of James get shot all to hell. Because while we weren't exactly rooting for James and the Heat last year â" not with the Mavericks playing such a beautiful style of basketball -- a lot of us were rooting for the end of the criticism. Something to make The Decision feel like it took place years before it actually did. Some rooted for James to play well because they thought he needed a fantastic Finals series, win or lose, to save his image from being continually sullied by The Decision. I just wanted him to play well to save my sanity from another 12 months of "LeBron be lettin' us down" stories. In a way, that wonderful lockout (and all the endless, frustrating, tales from it) saved us, but 12 months later we're back to it with LeBron, and rightfully so. The Decision was terrible, and LeBron dug his own hole by joining a team with two other stars but little wiggle room left to put together a proper supporting cast. As a narrative result, he has to play well. As a basketball result? The dude has to play well. He can't put together a 17 points per game average, as he did in 2011. Especially not with Dwyane Wade, who was brilliant on his way toward a 26.5 points per game average last year with 11 combined points/rebounds and 50 percent shooting, working with such an inconsistent touch in 2012. Forget The Decision, and pay attention to the decision making. To hear James tell it, he will be. And in a few hours, when the Finals tip off on Tuesday night, we can start to judge the man all over again.